“Are you ready to ride? Do you have your ticket? Hold on!” I would say when you were less than 4 years of age as I grasped the chains of your swing at the park. As I slowly, but surely, raised you off the ground, I’d state the “rules” in my best amusement park worker voice: “No kicking, no spitting and you must keep your arms, fingers, legs and feet inside the car at all times.” I’d make a clicking noise to replicate the sound of a roller coaster as it ascends upward on those long hills just before it ZOOMS down the other side. At the apex of the lift I’d switch to the back of the swing and start my pushing, slowly at first and then building in speed. And with each repetition, I’d make a new announcement, building with a crescendo as I pushed a little harder. Each time you’d squeal with delight. “She’s heading towards the trees, she’s heading above the trees, she’s heading to the sky, she’s heading past the sky…. She’s heading to the stars… She’s heading PAST the stars… She’s in outer space… Sheeeee’s OUT OF SIGHT!! !” I’d exclaim with great drama as I made my final and strongest push. Sitting on the edge of my seat at your high school graduation, I recited this little routine to myself that took place over and over during your childhood. 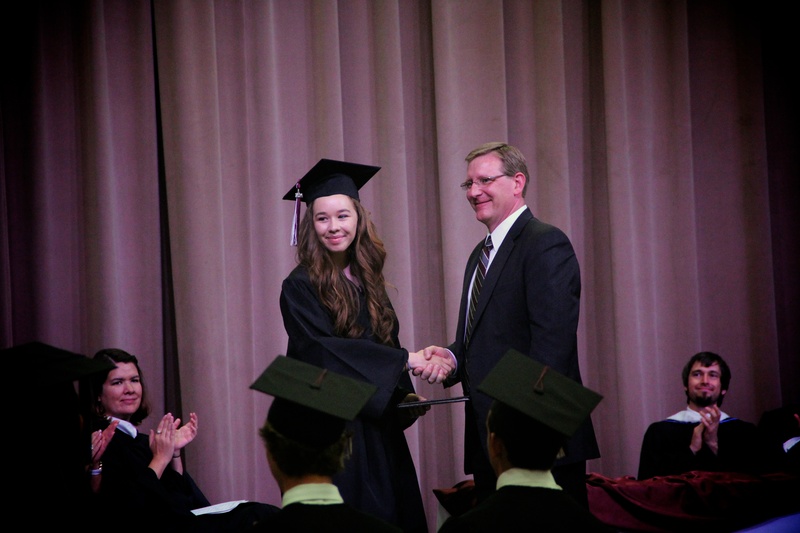 With a lump in my throat, I anxiously waited for this beautiful and intelligent young lady (that would be you) to make her march down the aisle and stand with her fellow classmates to receive her high school diploma. Where did the time go? It only seems like a few days since I had worked till midnight each night transforming an extra bedroom into a nursery for your arrival. Putting up the carefully selected Laura Ashley wallpaper on the lower half of your walls and painting the upper half in a matching pink. I loved searching out the best “going home from the hospital” outfits, along with a pretty little beaded bracelet that spelled out “Carissa,” a silver spoon and cup, and a big pink teddy bear. I still remember the phone call from the hospital alerting me to gather the children and make our way there to be a part of Carissa’s arrival! I remember clearly how that in the redecorating of the children’s rooms, Christina’s just delivered furniture was in boxes and little Matthew managed to get pinned under one of the boxes while I took the call from the hospital. There was also a worker in the kitchen repairing some cabinets. I quickly freed Matthew, told the worker to lock up as I swooped up the kids and headed to the hospital to greet the soon-to-arrive baby Carissa. Hours later Carol and I and the whole family greeted a precious baby girl who captivated us with her sparkling eyes, curly black hair and a heart for adventure. Somewhere between the moment in which you drew your first breath, and Carol and I were filled with a mixture of awe, amazement and gratitude, and this surreal graduation moment, a lot of life has been lived. First words, first steps, first bike ride and I was there. What a privilege it has been, what a miracle I have witnessed to receive this little bundle of life into our presence, to experience amazing moments together admiring sunsets, new foods, discovering our shared passion of travel, experiencing new places of incredible beauty together. To discover what we have in common and to learn from each other about those things that we don’t. To learn throughout this growing up process that God has instilled within you a intricate design that is incredibly unique to you, that YOU are a miracle, that YOU are unique, that YOU are loved beyond your ability to comprehend, not only by me, your earthly father, but far more importantly, by God, your Heavenly Father who created you. Yes, you might say that I have been practicing for this moment, warming up if you will, ever since that first push of the swing in the park… and you’d be right. So, I do believe you are ready, and I am proud of you. I will always be there, in your heart, pushing you a little farther and a little higher. Some of of my favorite blog posts of trips with Carissa! Some of my favorite trips with Carissa that I need to blog!